Winter, and its companion snow, can be wonderful and beautiful. But with that beauty comes a buildup of snow and ice on your vehicle. Removing snow and ice first thing in the morning isn’t an envious task for anyone, so it’s important to find the right snow and ice scraper for you and your vehicle. What size car or truck do you have? Do you sometimes have trouble reaching across longer distances? Not all ice scrapers share the same features, so it’s important to consider your personal needs and potential frequency of use. This is a perfect option for people with large vehicles such as trucks or SUVs. The extra long extender gives you reach and power for removing snow. 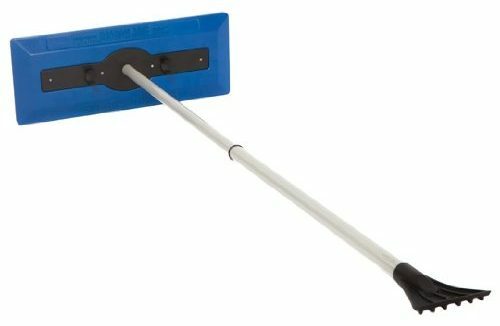 There is also a convenient squeegee on the opposite side of the broom. A cushioned handle grip will make the job easier, and the telescopic handle can be adjusted and locked to any length up to 52 inches. Versatility is the key word with this snowbroom. The durable construction makes snow and ice removal easier, and has separate blades specific to ice and frost removal. The extendable handle has a quick lock function and features two foam grips for convenient handling no matter what the task. 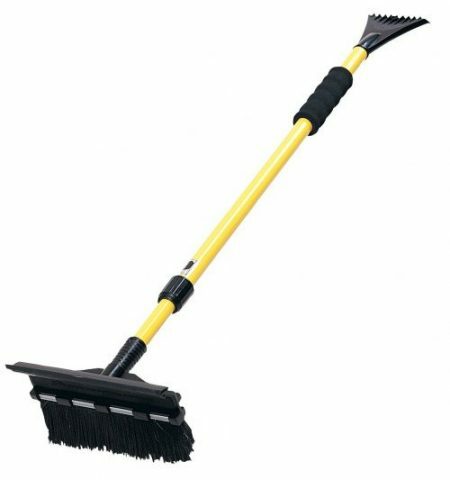 Snow removal is a breeze with specially designed soft and firm bristles, a squeegee, and an ice chipper. This compact ice scraper includes a waterproof storage bag for added convenience and is constructed of durable, extra-thick plastic designed for ergonomics and power. The ice scraper is designed to be tough on ice but easy on your windshield, and the scraper has a unique Claw feature designed to break up the thickest ice buildup. You can be sure of your purchase, as Primary Automotive includes a 10-year warranty. CJ Industries attractive ice scraper features a brass blade safe for your windshield. The blade is great for easily cutting through ice and frost and is a highly economical choice. 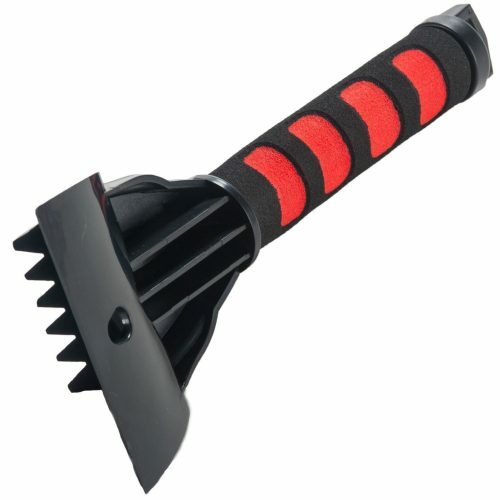 The scraper is compact at about 9 inches and comes in a variety of color options: black, red, blue, or yellow. The size makes it ideal to fit in most glove compartments. Another quality product by Subzero is both versatile and affordable. 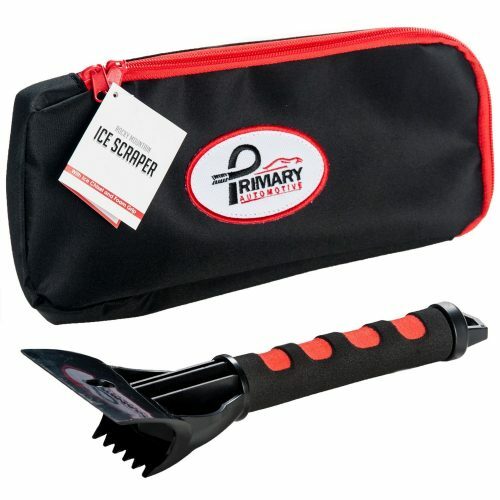 The scraper/brush combination includes built-in ice chippers and a flat blade for efficient ice removal, and the molded handle grip is designed with durability in mind. The brush in in-line with the handle, so it won’t take up much space in your car or trunk. This is a perfect choice for compact and mid-sized cars. The extended reach of this snow remover makes it a great choice for people with large vehicles, or for people who need to move large amounts of snow from your hood, roof, etc. The foam head works like a snowplow to push snow off of your vehicle. The ice scraper also features “jaws”, which allow you to easily break up larger pieces of ice and remove them from your car. For added convenience, the ice scraper can detach from the rest of the unit. RevHeads’ ice scraper is specifically designed for extreme cold weather climates, and is a favorite of residents from areas like the US Northeast and Midwest. The ice scraper also includes a claw feature to break up ice chunks, and the blade provides even removal. The scraper has a foam grip to make it easier on your hands, and the slightly longer handle gives you the reach you need for your windshield, even on larger vehicles. The chisel blade is over 4 inches wide, making your job easier and allowing you to scrape ice in less time. 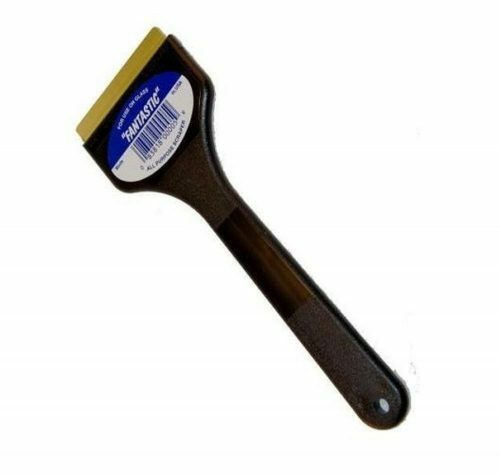 If you have an exceptionally large vehicle or maybe if you’re a little shorter in height, this brush and scraper will be a great option for you. The unit is light, making it easy to manipulate at longer distances, and the telescopic handle has locking points at intermittent distances. 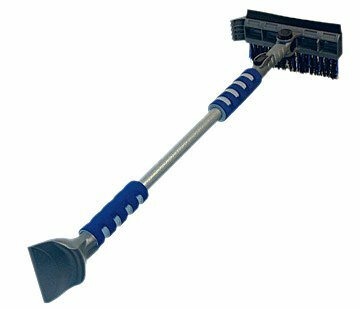 The brush has a cushioned grip across the full length of the handle (unextended), and comes in an attractive blue and chrome finish. Mallory USA has created a reputable brand of high-quality snow and ice tools, and this snowbrush and scraper is no exception. The tool is lightweight and ergonomically designed with the user in mind; it features a curved handle and a foam grip for easy handling. At a length of 26”, this model can reach across fairly broad windshields, roofs, and hoods. Heavy-duty bristles make snow and ice removal easier, faster, and more convenient. 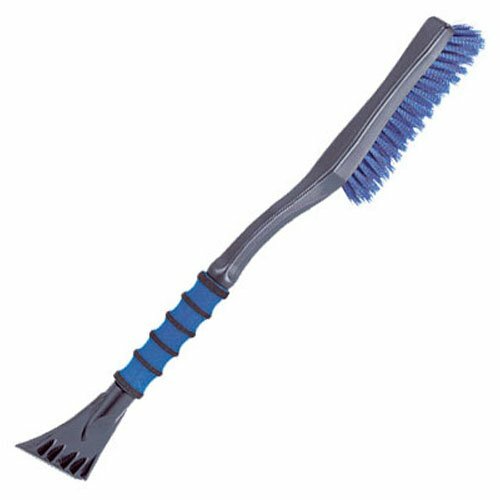 This snow broom features a non-abrasive foam head, designed to easily push snow off of your vehicle without damaging the glass or paint. The handle features a built-in ice scraper designed to make snow and ice removal a faster job. The telescopic pole locks in place and extends to 49 inches, perfect for larger vehicles or people shorter in height. Be prepared this winter season with the right ice scraper or snow remover for your vehicle. Some ice scrapers and snow removers and better suited for certain tasks, or are designed to allow for a specific length. You may not need an extender, or you may need more than simply and ice scraper. Make your life easier this winter with the best snow and ice scrapers on the market.